← 206. Bambi. (22 Nov. 17). Seems that every time I post something new the phrase “It’s been a while since my last post but….” is a bit more scuffed and worn than the last time I abused it. So I’m giving it a day off this time. The following is inspired by two of the bedrocks of my existence in this life, Edinburgh and music. It came into being during the course of last Friday (13/04/18) when the city was wrapped in the kind of dull mist that rolls off the North Sea sometimes that feels like a cloud just crash landed. The other side of the Forth that is Fife, normally visible from The Bridges was removed from our awareness, and the fairy tale castle was reduced to barely an outline. While Arthur’s Seat the granite hill that overshadows all had a day to itself away from prying eyes. Edinburgh Castle hiding in the low flying cloud, taken through the window of the bus home. I’d been sat at the desk half the morning with half a mind on how such a day deserved a few words to preserve it but no ideas to tell me how to begin. Then the weeks two earworms, the opening to Suzanne Vega’s “Cracking,” “It’s a onetime thing, it just happens, a lot, walk with me, and we will see, what we have got,” and the opening to Tanita Tikaram’s “Good tradition,” slightly mis-remembered as “It’s a good tradition of love and hate staying by the fireside” tumbled over into one of this life’s great loves. Nanci Griffith. Someone I’ve loved a little bit more with each album acquired provided a solution with what was feeling like “It” was becoming the word of the day. “It’s a hard life wherever you go,” did just the trick. The rest, now, is history. Hopefully the liberty taken with the weather based pun in the title won’t dent it’s reputation any…. 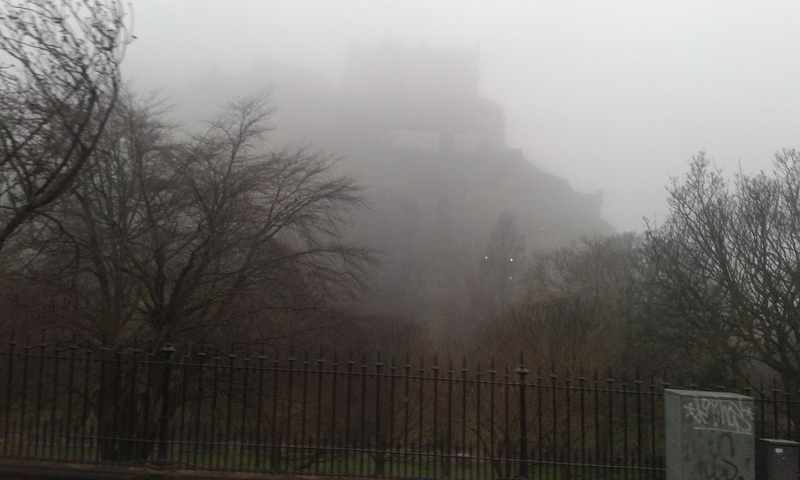 Through our misty granite Lothian limbo. This entry was posted in Lyrics & poems and tagged castle, cloud, Edinburgh, haar, Lothian, Nanci Griffith, Poem, Suzanne Vega, Tanita Tikaram, weather. Bookmark the permalink. 2 Responses to 268. Edinburgh mornings 15: It’s a haar life. (13 Apr. 18). A very nice journey of aspirations. I love the imagery and construction!! Lot s feelings explored. Thanks, and sorry for the late reply, I’m really bad at managing the site but was away on retreat for a couple of weeks (don’t mention the lazing about since getting back). Back to the grind in Mordor tomorrow. It was one of those days we get here sometimes and there was a degree of emotion in it too as you rightfully say. Apart from the atmosphere of the day, Nanci Griffith holds a special place in my affections (a besotted fan). The “Edinburgh mornings” series has been a lot of fun since it started a few months ago, and it seems to drive itself. I need to post something again, so I must have a look through them.